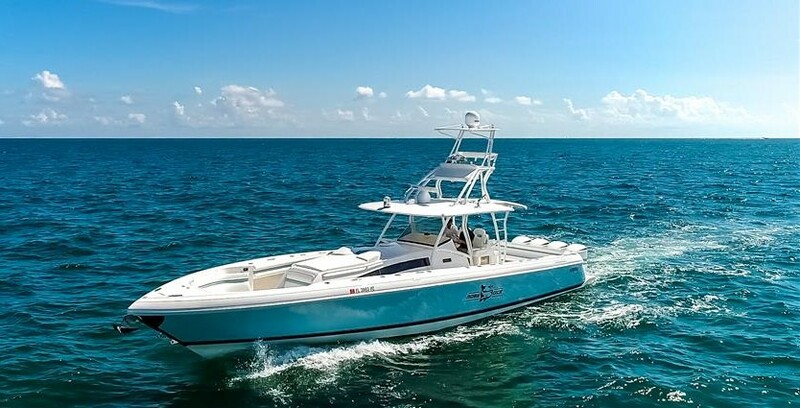 This captain and crew maintained yacht tender 400 Cuddy by Intrepid Powerboats was built with few unique modifications and fabrication techniques that deliver an outstanding smooth and dry ride. The vision for building this beauty was for her to be a chase boat which desired high speeds for exploration but more importantly was looking to run at lower speeds. To accomplish this, the owner added an additional 80 gallon ballast water tank under the forward cabin bunk, he installed Mercury racing K-plane trim tabs, Mercury active trim, and USA made Bob’s machine Jack Plates. The boat is powered with cold fusion white Triple Mercury Racing 400R Outboards. She puts out top speeds of 63 mph and cruises in the lower 40s. The helm station is fully loaded with a custom user-friendly Garmin package. For the days of surfing and paddle boarding at your favorite places, the beautifully custom designed roof rack will accommodate any boards of your choice. It frees up the cockpit space to entertain more visitors. For long trips and unexpected harsh weather conditions, a full sided hard enclosure was installed on this boat. Port and Starboard roll up enclosure doors give you the flexibility to choose when to close off the area. Front and side hard enclosure panels can open to allow all the breeze you need on days you wish to feel the wind. This owner installed a riviera helm station which has an electric grill, hot and cold sink, dual refrigeration, a 110 outlet and storage on port and starboard sides. The swing in dive door with its industrial looking stainless steel hardware is evidence of Intrepids dedication to always lead the industry with design features. From allowing guest to walk aboard from the dock or letting fisherman pull their catch in without interference, you have to appreciate the power of a dive door. Every corner of this boat has options that make this boat convenient, practical and fun. Walking down into the cabin, you will find three separate sleeping areas. The hi-lo electric table converts the settee into a berth, forward of the berth is a bunk and a large fixed bed aft to midship. The sleeping layout can also act as 3 separate sleeping quarters for crew. The natural light that enters this cabin is enough to keep you relaxed. This particular boat was treated with a ceramic coating from head to toe, extending the life of the boat and giving its owner the satisfaction of an easy to clean vessel. The owner spared no expense on this Intrepid, even the antifouling was sprayed on instead of rolled. Everything about this Intrepid is amazing. From its sleek style to its performance, from the comfort to its utility. All you would expect from intrepid Powerboats.